The Kaudulla national park was opened in September 2002. It is situated near Habarana and the size is 6,656 hectare. At Kaudulla it is possible to hire a catamaran to sail on the tank and look out for the rich wildlife e.g. elephants, leopards, sambar deer, fishing cats and the rusty spotted cat. Or hire a jeep and make a safari in the jungle to see the wildlife, mainly herds of elephants. The Uda Walawe national park was designated in 1972 to offer a refuge to migratory elephants, during the time it has also become a sanctuary for many other mammals, including spotted deer, toque monkey, wild pig, grey langur, leopard and sambar, as well as numerous birds. Nearly 100 bird species may be spotted here in a single day. Uda Walawe is particularly rich in raptor species, among them white-bellied sea eagle, changeable hawk eagle and crested serpent eagle. The park is situated around the Uda Walawe Reservoir, a man-made lake (tank) and a variety of terrain (open grassland, teak plantation and jungle) can be found. The Wasgamuwa national park is situated within the Polonnaruwa and Matale Districts, around 200km far from Colombo. The Mahaweli river and the Amban river are the boundaries of the sanctuary. The environment is predominated by tropical intermediate dry mixed evergreen forests. 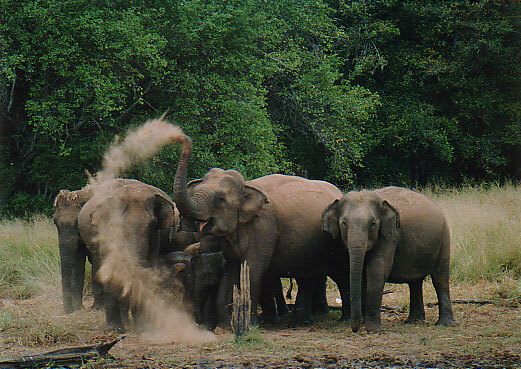 Bundala national park is the latest addition to the national parks and is situated 260 km away from Colombo. 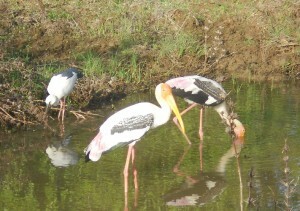 It is a home to all species of water birds resident in the country and also migrant birds. The Yala national park covers almost 1000 km2 and is Sri Lanka's most popular national park. 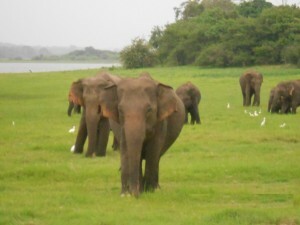 It is also called Ruhuna national park. Well known especially for observing mammals living in the scrub jungle, the riverine woodland, the open savannah and being along the coastline. A part of the national park is open for visitors and safaris by jeeps are offered. But one also has to have some luck to spot the game living in the sanctuary. The bird sanctuaries at Kumana, Wirawila and Kalametiya are all situated in Sri Lanka's extreme south eastern coast near lagoons. These coastal sanctuaries are exotically picturesque with combinations of lagoon, swamp, jungle, river, lake and plain. Large flocks of resident and migrant aquatic birds can be observed here. The highland sanctuaries at Udawattakele are heaven for some rare flora such as our unique Vesak Orchid and for hundreds of very colourful butterflies as well as for the birds. The Udawattakele sanctuary is situated in the suburbs of Kandy. It is a great place for elephant spotting all year round; as the dry season makes water scarce between June and September, more and more elephants gather on the shores of Minneriya Tank. By late August and September, the awe inspiring site of 150-200 elephants gathered together can often be seen, in a phenomenon known as ‘The Gathering’. It is the largest concentration and gathering of Asian elephants that can be seen anywhere in the world. Watching baby elephants playing with each other, bull elephants tussling for dominance and the great matriarchs surveying the scene is not a sight you are likely to forget in a hurry. Aside from the elephant, Minneriya is also home to some 23 other species of mammals: some, like the Deer and Sambur you will see, some like the Leopard and the Sloth Bear will prove elusive. The arid dry zone is a paradise for many species of lizard and you will see them here in all their colour brilliance if you look carefully enough, as well as snakes like the Indian Python and the Mugger Crocodile. 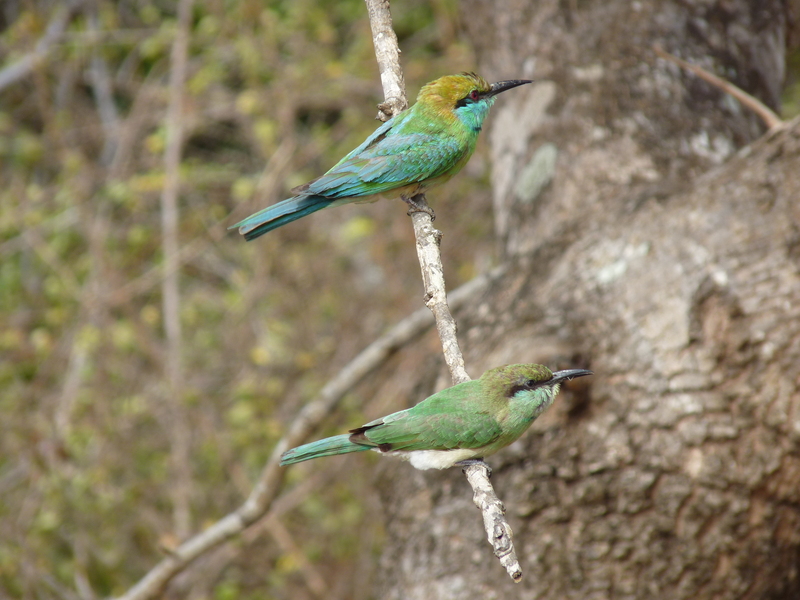 Above all, are Sri Lanka’s wonderfully varied bird populations. Among the 150 or so species, particular favourites of ours you may see in Minneriya include the beautiful painted stork, the pelican, and various eagle species, as well as the endemics: the Sri Lankan Jungle Fowl, the Sri Lanka Hanging Parrot, and the Sri Lanka Gray Hornbill.